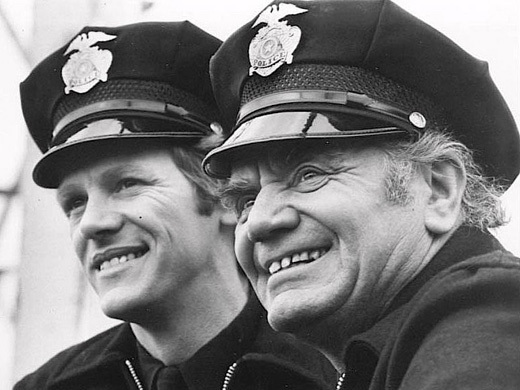 40 years ago a cop show dared to be different and only lasted a handful of episodes and a follow-up TV movie. Future Cop is a gimmick inspired through the success of The Six Million Dollar Man but also may have been an unconscious inspiration for Verhoeven’s Robocop (1984) or, most recently, the JJ Abram’s TV production show: Almost Human (2013). The premise is simple enough; a veteran/close to retirement/old school cop Joe Cleaver (Borgnine) reluctantly takes on mentoring a gumshoe rookie cop, Haven (Michael Shannon). Particular actions by Haven leads Cleaver to go from cynical to complete loyalty especially when Cleaver is privileged to learn the secret behind Haven’s odd behavior. Cleaver is sworn to secrecy even from his long time other partner Bundy (John Amos). While watching the entire series I keep asking myself why wouldn’t Cleaver tell Bundy what Haven was? On the field, as an officer, I would think trust and full disclosure would be par for the course? Would that not save lives? In the first official TV episode (Fighting O’Haven) Cleave keeps Havens’ secret from Bundy only to collect a bet at the end of the episode? Ugh, like I’ve most likely said, I believe we’re more sophisticated and informed as an audience than we ever have been in the past. There is no way any of the actors in this show spent some real time with police officers. It’s a total cop-life fantasy. I don’t know what the landscape of television was like back in 1976 other than time-tested cartoons, Sesame Street, and alike. I was 2 years old at the time and I maybe watched the show but only if my dad would suggest to sit down and watch it with me. It certainly didn’t resonate with me if I did happen to watch it. I can see how it would be very boring for a kid of really any age because there wasn’t enough ‘oomph’ or, in modern terms, ‘money shots’. Sure there were chase scenes or some gunplay but not enough in the realm of sci-fi technology visual wonderment. I’m guessing the budget didn’t provide enough to do some real cool camera tricks or visual effects. They couldn’t even muster a Westworld (1973) open face mechanical reveal. It’s those types of things, even if it’s only one episode of an entire series that would’ve keep me wanting more. We’re so spoiled today with (mostly subtle) CGI that context over content is more important… rightfully so. Future Cop is dated. 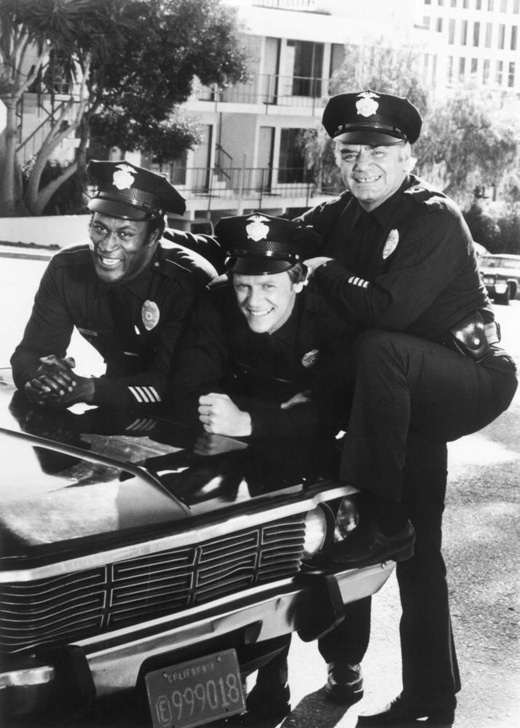 In its short run episodic but time-capsule what-we-thought-cops-were-like back before asking a cop what it was like being on a beat it’s still pretty fun to watch. It quickly goes down the path of late episode The Incredible Hulk (1978) filler/naiveté. 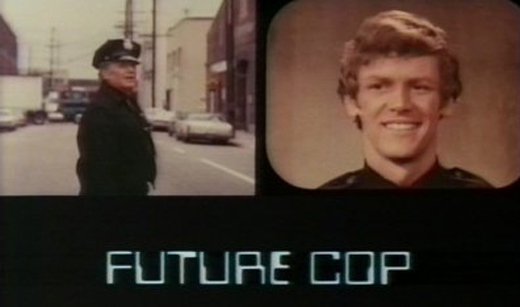 Like myself, if you like watching/worshiping old episodes of CHiPs, Future Cop is a very nice supplement/companion. I found myself wanting Future Cop as a prequel to one of my most beloved movies: Super Fuzz/Super Snooper (1980). The Mad Mad Bomber (two-part episode edited into a Friday night movie of the week) is the most enjoyable and engaging to watch. It’s a time of when the United States was smoldering over the Vietnam “Conflict”. It doesn’t go too deep into social commentary, it’s all pretty surface level in regard to situations and stereotypes, but it has its moments of real threatening domestic terrorism and political prisoner release demands. The soundtrack is also really good, among the average/derivative gumshoe detective music; it periodically twists into a melting pot of György Ligeti meets Tom Robbins. In somewhat reality it least, if anything, it’s nice to watch a cop show where they do actual detective work even if there is not mention of doing paperwork. If you do see action it’s a low rent car chase/car crash. I’m also pleasantly surprised to see elements of proper police procedure… in the way that their captain is kept abreast of what is going on so Cleave can continue the investigation with probable cause. A lot of cop shows during that time were more maverick than procedural. Overall it’s a strange dynamic as though a preteen were to come up with an android cop concept then the actual producers and writers had to make sure it also appealed to adults. If you love Ernest Borgnine, John Amos, “in the now/then” awkward android childlike questions, and full-on 70’s conceptions then this series is for you. I wish it had more sci-fi elements such as a FX money-shots but, like I said budgetary, it couldn’t do that on the scale it wanted to. Other than the car chases, you may see the occasional helicopter or two. Explosions are the canned-sparkle explosions or at the very best a barrel blast. It’s a nice clean transfer to DVD but what else do you need or expect? The color balancing looks natural but, to be nit-picky, the audio mix is inconsistent due to the original source. There are times where the sound mix introduces too much background noise and/or sounds too much like deadened ADR. It does get better with the few remaining episodes on disc 2 but as with most series of its time falls into episodic wrap-ups. There really isn’t a common story arch other than a cop that is an android and the “villains” are disposable. Overall not as deeply introspective or philosophical as Star Trek: The Next Generation, Starman, or Almost Human but there is naïve sweetness to the entire series with a Geordie-Data sentiment. Easily entertaining for someone like myself who missed this show when it aired but remember the decade with fondness. Distributed by Mill Creek Entertainment. “Future Cop: The Complete Series” DVD (2016). Anyone got a torrent of this?